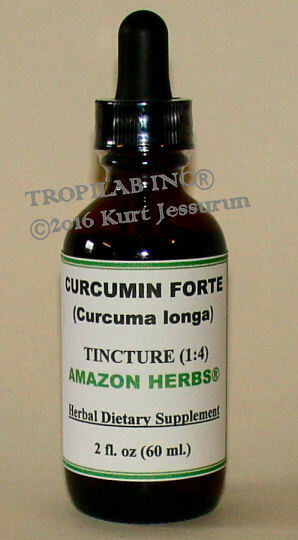 CURCUMA LONGA TINCTURE - TURMERIC RHIZOME EXTRACT. Traditionally, the rhizomes (underground root) of Curcuma longa and Xanthorriza (Tumeric spices), from the Zingeberaceae family, have been used as a natural remedy for liver problems and indigestion. Curcuma xanthorriza is also known as Javanese turmeric. These yellow spices are used widely in Indian- and Caribbean cuisine. Whole turmeric is more effective than isolated curcumin for inflammatory disorders, including arthritis, tendonitis, and autoimmune conditions. Turmeric has been used for thousands of years in Ayurvedic and Traditional Chinese medicine to treat many diseases and ailments, among others: stimulate digestion, boost liver function, against gout and regulate menstruation. The spices have also been used successfully against internal parasites in traditional medicine; controlling the herpes virus (makes cells more resistant to invasion by this virus). Its strong anti-inflammatory action will also help control discomfort caused by outbreaks. Many clinical trials in humans are underway, studying the effect of this spice in diseases, including multiple myeloma, pancreatic cancer, myelodysplastic syndromes, colon cancer, psoriasis, leishmaniasis and Alzheimer's disease. It also may be used to prevent bone loss, as an effective blood thinner and against osteoporosis. For more information about the treatment of gout with Curcumin, go to the GOUT PAGE. Curcuminoids* (curcumin, dicinnamoyl - methane,bis - demethoxy - curcumin, demethoxy curcumin). Terpenoids (sesgueterpenoids, monoterpenoid), Xanthorrhizol (sesquiterpenoid). Essential oils (camphor, isofurano - germacrese, cineo, borneol). Major volatile components: 1,8-cineol and curzerenone. Cinnamaldehyde. Starch / carbohydrate (30% - 40%). Curcuma xanthorriza contain 6 - 11 % of 1 - cyclo iso prene myrcene essential oil. *Curcuminoids (Curcumin and the related compounds) are natural polyphenols. About 2 - 8 percent of turmeric is made up of curcuminoids. Curcumin has been proven to exhibit anticarcinogenic, anti-inflammatory and powerful antioxidant properties (ability to neutralize free radicals). It also stimulates the immune functions of macrophages. These antioxidant properties are far stronger than vitamin E and C; they are strong enough to scavenge the hydroxyl radical (the most reactive of all oxidants). Curcumin main application is as an anti-inflammatory herbal drug that produces far fewer side effects than commonly used prescription drugs. This inflammation includes those caused by (rheumatoid) arthritis, swelling pain, muscle sprain, surgical incisions. It is an effective painkiller, comparable to Ibuprofen but without the side effects associated with this OTC drug. In addition, it lowers LDL cholesterol and is able to cure hepatitis (broad spectrum hepatoprotective agent). Other constituents, such as xanthorrhizol also have excellent antimicrobial activity, among others, against oral microorganisms. (Curcuma longa) has almost twice as much Curcuminoids, the most active ingredient in the extract. Curcumin blocks the Tumor Necrosis Factor (TNF); in addition it crosses the blood-brain-barrier which can make it extremely useful in combating brain cancer. When used for the cancer fighting capabilities, it shows a remarkable effect in intervening with initiation and growth of cancer cells and tumors. It inhibits the progression of chemically induced colon and skin cancers. Curcumin has been shown to enhance the effectiveness of certain, anti cancer drugs and also improve the effectiveness of radiation treatment. The tumor cells are prevented from developing the so called radiation resistance. Curcumin can both prevent - and treat many cancers. It suppresses LOX 2, NOS MMP 9 and COX (these are enzymes that make carcinogens much more active once they are in the body; they also allow cancerous cells to grow new blood vessels). The area of the kinase inhibitors is a hot area of oncology drug development. There are many of these protein kinases and they act as message lines into the DNA command center of the cells. Curcumin can effectively block a number of these lines. It has the ability to naturally prevent skin cancer, is effective against colon cancer; it also enhances immunity and stops angiogenesis (ability to enable tumors to create an own blood supply). Xanthorrhizol (a sesquiterpenoid compound isolated from the rhizome), exerts anti-metastatic activity in vivo. A recent study suggests that combination of curcuminoids, essential oils of C. domestica and C. xanthorrhizza, have anti-inflammatory effects comparable to Piroxicam (Feldene®), a known anti-inflammatory agent. In laboratory tests, Curcumin + the cancer drug Taxol® (Paclitaxel) performed far better in controlling lung cancer than when given Taxol® alone. A primary reason that head and neck cancer treatments fail is that the tumor cells become resistant to chemotherapy drugs. A curcumin-based compound (FLLL32), added to head and neck cancer cell lines, was able to cut the dose of the anti-cancer chemotherapy drug Cisplatin by four while still killing tumor cells equally as well as the higher dose of cisplatin without FLLL32. Alzheimer's disease, appetite loss, arthritis, bursitis, chemotherapy, cystic fibrosis, gallbladder problems, gout, high cholesterol, hypertension, injuries, jaundice, kidney disease, liver disease, lupus, malaria, potentiate the effect of chemotherapy, prevention and treatment of cancer, prostatits, ulcers, urinary tract infection (UTI). It inhibits the destruction of the joints from arthritis by inhibiting the protein NF-kB that activates an inflammatory respone. Curcumin kills cancer cells long before they can be detected; it induces cancer cell apoptosis (cell suicide). Epidemiological studies have linked the frequent use of turmeric to lower rates of breast, prostate, lung and colon cancer. As such is has high promise to be used as an effective natural cancer treatment and prevention medicine. Against cholesterol: 1, 5 - 2 ml. (45 - 60 drops), 3 - 4 times daily. Cancer: 2000 - 4000 mg / powder daily. Tincture: 1½ - 2 ml. Infusion (herbal tea): 1 - 2 cups daily. To improve bio availability of Curcumin as a tea (Tumeric extract), add black pepper or piperine. Turmeric is "generally recognized as safe" (GRAS), as a food additive by the FDA and serious adverse effects have not been reported in humans taking high doses of Curcumin. It is also on the Commission E (Germany�s regulatory agency for herbs) list of approved herbs. If you take medications or undergo chemo- and / or radiotherapy for treating cancer, be cautious about possible interactions of Curcumin. Consult your oncologist and radiologist. Patients with gallstones, bile duct obstruction, stomach ulcers and hyperacidity disorders should refrain from taking this herbal supplement. As a precautionary measure, Curcumin should not be used during pregnancy unless under supervision of a physician. Anticoagulants / antiplatelets: Curcumin may increase risk of bleeding. When using non-steroidal pain relievers (Ibuproven), avoid Curcumin. For more information on Curcumin, go to the "Curcuma xanthorrhiza plant" page. This invention relates to naturally occurring pharmaceutical compositions, more particularly, those compositions of compounds isolated from the plant genus Curcuma, which are useful as anti-inflammatory agents. Inhibition of growth and sensiti- zation to cisplatin-mediated killing of ovarian cancer cells by polyphenolic chemopreventive agents. Chan MM, Fong D, Soprano KJ, Holmes WF, Heverling H.
J Cell Physiol. 2003 Jan;194(1):63-70. Curcumin (diferuloylmethane) down-regu- lates the constitutive activation of nuclear fac- tor-kappa B and IkappaBalpha kinase in human multiple myeloma cells, leading to suppression of proliferation and induction of apoptosis. Bharti AC, Donato N, Singh S, Aggarwal BB. Anticancer potential of curcumin: preclinical and clinical studies. Aggarwal BB, Kumar A, Bharti AC. Potent protective effects of sesquiterpenes and curcumin from Zedoariae Rhizoma on liver injury induced by D-galactosamine/lipopolysaccharide or tumor necrosis factor-alpha. Morikawa T, Matsuda H, Ninomiya K, Yoshikawa M.
Medicinal foodstuffs. XXIX. Kyoto Pharmaceutical University, Japan. Free Shipping in USA with USPS FCM or PMS (tincture orders over $40.00). (Cancers Lett 1999 Apr 1; 137 (2): 123 - 30). (Cancer Res 1999 Feb 1; 59 (3): 597 - 601). Tufts researchers say "a mixture of curcumin and isoflavonoids is the most potent inhibitor against the growth of human breast tumor cells". These data suggest that combinations of natural plants compounds may have preventive and therapeutic applications against the growth of breast tumors induced by environmental estrogens (Environ Health Prspect 1998 Dec; 106 (12): 807 - 12). CA 92093 - 0688, USA. (Proc Soc Exp Biol Med 1998 Mar; 217 (3): 369 - 78). Curcumin may or may not protect against cellular from damage from radiation, perhaps depending on dose. It appears to protect against damage to certain organs brought about by some chemotheraphy agents. In hamsters it protects the kidneys from Adriamycin (Br J Pharmacol 2000 Jan; 129 (2): 231 - 4). If you are taking radiation or chemotherapy, it is very important to discuss your diet and use of any antioxidants with your oncologist. Typical dietary amounts of tumeric have an antioxidant effect that protects rats from cataracts (Toxicol Lett 2000 Jun 5; 115 (3): 195 - 204). But in one study rats heavily dosed developed more cataracts signs. Curcumin protects rats from liver - damage cause by toxins (J Pharm Pharmacol 2000 Apr; 52(4): 437 - 40; Carcinogenesis 2000 Feb; 21 (2): 331 - 5). But in one experiment, mice fed anti - cancer doses of curcimin for 14 days developed enlarged, damaged livers. Dosing mice with curcumin for 14 days damaged their livers. Curcumin prevents formation of some tumors: J Cell Biochem Supll 1997; 27: 26 - 34. In hibitory effects of curcumin on tumorgenesis in mice. Huang MT, Newmark HL, Frenkel K Department of Chemical Biology, College of Pharmacy, Rutgers - State University of New Jersey, Piscataway, NJ 08854 - 8020, USA. Arousal of the human system through "heat shock" response: Curcumin induces the stree response. Drink green tea with a meal spiced with tumeric for double - boosted anti - cancer protective effects: "EGCG and curcumin, were noted to inhibit growth by different mechanisms, a factor which may account for their demonstrable interactive synergistic effect". Memoral Sloan - Kettering researchers, 1998. Curcumin amd genistein protect breast cells against DDT and other pesticides. Tufts School of Medicine, 1997. Chan MM, Fong D, Soprano KJ, Holmes WF, Heverling H, Inhibition of growth and sensiti - zation to cisplatin - medicated killing of ovarian cancer cells by polyphenolic chemopreventive agaents. J Cell Physiol. 2003 Jan; 194 (1): 63 - 70. Navis L, Sriganth P, Premalatha B, Dietary curcumin with cisplatin administration modu - lates tumor marker indices in experimental fibrosarcoma. Pharmacological Research. 1999 Mar; 39 (3): 175 - 79. Ichiki K, Mitani N, Doki Y, Hara H, Misaki T, Saiki L, Regulation of activator protein - 1 activity in the mediastinal lym[h node metas - tasis of lung cancer. Clin Exp Metastasis. 2000; 18 (7): 539 - 45. Bharti AC, Donato N, Singh S, Aggarwal BB. Curcumin (diferuloylmethane) down - regu -lates the constitutive activation of nuclear fac - tor - kappa B and lkappaBalpha kinase in human multiple myeloma cells, leading to suppression of proliferation and induction of apoptosis. Blood. 2003 Feb; 101 (3): 1053 - 62. Lin JK, Chen YC, Huang YT, Lin - Shiau SY, Suppression of protein kinase C and nuclear oncogene expression as possible molecular mechanisms of cancer chemoprevention by apigenin and curcumin. J Cell Biochem Suppl. 1997; 28 - 29: 29 - 48. Cheng Al, Hsu Ch, Lin JK, et al. Phase l clini - cal trial of curcumin, a chemopreventive agent, in patients with high - risk or pre - malig - nant lesions. Anticancer Res. Juli - Aug 2001; 21 (4B): 2895 - 2900. Miyoshi N, Nakamura Y, Ueda Y, et al. Dietary ginger constituents, galanals A and B, are potent apoptosis inducers in Human T lymphoma Jurkat cells. Cancer Lett. 2003 Sep 25; 199 (2): 113 - 9. Chan WH, Wu CC, Yu JS, Curcumin inhibits UV - induced oxidative stress and apoptotic biochemical changes in human epidermoid carcinoma A431 cells. J Cell Biochem. Oct 2003; 90 (2): 327 - 38. Menon LG, Kuttan R, Kuttan G. Antimeta - static activity of curcumin and catechin. Cancer Lett 1999 Jul 1; 141 (1 - 2): 159 - 65. Aggarwal BB, Kumar A, Bharti AC. Anticancer potential of curcumin: precclinical and clinical studies. Anticancer Res. Jan - Feb 2003; 23 (1A): 363 - 98. Ikezaki S, Nishikawa A, Furukawa F, et al. Chemopreventive effects of curcumin on glandular stomach carcinogenesis induced by N - methyl - N - nitrosoguanidine and sodium chloride in rats. Anticancer Res. 2001 Sep - Oct; 21 (5): 3407 - 11. Dorai T, Cao YC, Dorai B, Buttyan R, Katz AE. Therapeutic potential of curcumin in human prostate cancer. III. Curcumin inhibits proliferation, induces apoptosis and inhibits angiogenesis of LNCaP prostate cancer cells in vivo. Prostate. 2001 Jun 1; 47 (4): 293 - 303. Nakamura K, Yasunaga Y, Segawa T, et al. Curcumin down - regulates AR gene expression and activation in prostate cancer cell lines. Int J Oncol. 2002 Oct; 21 (4): 825 - 30. Gururaj AE, Belakavadi M, Venkatesh DA, Marme D, Salmath BP. Molecular mechanisms of nti - angiogenic effect of curcumin. Biochem Biophys Res Commun. 2002 Oct 4; 297 (4): 934 - 42. Hour TC, Chen J, Huang CY, Lu SH, Pu YS. Curcumin enhances cytotoxicity of chemotherapeutic agents in prostate cancer cells by inducing p21 (WAF1 / CIP1) and C/EBPbeta expressions and suppressing NF - kappaB activation. Prostate. 2002 May 15; 51 (3): 211 - 8. Hwang JK, Shim JS, Baek NI, Pyun YR. Xanthorrhizol: a potential antibacterial agent from Curcuma xanthorriza against streptococcus mutans. Ray SN, Chattopadhyay N, Mitra A, Siddiqi M, Chatterjee A, Curcumin exhibits anti - metastatic properties by modulating integrin receptors, collagenase activity, and expression of Nm23 and E - cadherin. J Environ Pathol Toxicol Oncol. 2003; 22 (1): 49 - 58. Reddy BS, Rao CV. Noval approaches fr colon cancer prevention by cyclo - oxygenase - 2 inhibitors. J Environ Pathol Toxicol Oncol 2002; 21 (2): 155 - 64. Somasundaram S, Edmund NA, Moore DT, Small GW, Shi YY, Orlowski RZ. Dietary curcumin inhibits chemotheraphy induced apoptosis in models of human breast cancer. Cancer Res. 2002 Jul 1; 62 (13): 3868 - 75. Imaida K, Tamano S, Kato K, et al. Lack of chemopreventive effects of lycopene and curcumin on experimental rat prostate car cinogenesis. Carcinogenesis. 2001 Mar; 22 (3): 467 - 72. Satoskar RR, Shah SJ, Shenoy SG, Evaluation of anti - inflammation property of curcumin in patients with postoperative inflammation. Int J Clin Pharmacol Ther Toxicol 1986 Dec; 24 (12); 651 - 4. Kulkami RR, Patki PS, Jog VP, Gandage SG, Patwardhan B. Treatment of osteoarthritis with a herbomineral formulation: a double blind, placebo controlled, cross over study. J Ethnopharmacol. 1991 may - jun; 33 (1 - 2): 91 - 5. Arora RB, Basu N, Kapoor V, Jain AP. Anti inflammatory studies on Curcuma longa (tumeric). Ind J Med Res 1971 Aug; 59 (8): 1289 - 95. Abdul Rasyid PhD, Abdul Rashid, Abdul Rahman PhD, Kamaruddin Jaalam PhD and Aznan Lelo PhD. Effect of different curcumin dosages on human gall bladder. Deodhar SD, Sethi R, Srimal RC. Preliminary studies on antirheumatic activity of curcumin (diferuloyl methane). Ind J Med Res. 1980 Apr; 71: 632 - 4. Chan MM, Ho CT, Huang HI. Effects of three dietary phytochemicals fom tea, rose mary and turmeric on inflammation induced nitrate production. Cancer Lett. 1995 Sep 4; 96 (1): 23 - 9. Chopra RN, Chopra IC, Handa KL and Kapur LD in Indigenous Drugs of India, UN Dhar and Sons, Calcutta, 1958, p. 325..
Claeson P, Panthong A, Tuchinda P, Reutrakul V, Kanjanapothi D, Taylor WC, Santisuk T. Three nonphenolic diarylheptanoids with anti inflammatory activity from curcuma xanthorriza. Claeson P, Pongprayoon U, Sematong T, Tuchinada P, Reutrakul V, Soontornsaratune P, Taylor WC. Non phenolic linear diarylheptanoids from curcuma xanthorriza: a novel type of topical anti inflammatory agents: structure activity relationship. Ramsewak RS, DeWitt DL, Nair MG. Cytotoxicity, antioxidant and anti - inflammatory activities of curcumins l - lll from Curcumalonga. Phytomedicine. Jul 2000; 7 (4): (303 - 8). Mesa MD, Aguilera CM, Ramirez Tortosa CL, et al. Oral administration of a tumeric extract inhibits erythrocyte and liver micro some membrane oxidation in rabbits fed with an atherogenic diet. Nutrition. Sep 2003; 19 (9); 800 - 04. Quiles JL, Aquilera C, Mesa MD, Ramirez Tortosa MC, Baro L, Gil A. An ethanolic aqueous extract of Curcuma longa decreases the susceptibility of liver microsomes and mitochondria to lipid peroxidation in atherosclerotic rabbits. Biofactors. 1998; 8 (1 - 2): 51 - 7. Dikshit M, Rastogi L, Shukla R, Srimal RC. Prevention of ischaemia induced biochemical changes by curcumin and quinidine in the cat heart. Indian J Med Res. Jan 1995; 101: 31 - 5. Ramirez Tortosa MC, Mesa MD, Aguilera MC, et al. Oral administration of a turmeric extract inhibits LDL oxidation and has hypocholesterolemic effects in rabbits with experimental atherosclerosis. Atherosclerosis. Dec 1999; 147 (2): 371 - 8. Quilles JL, Mesa MD, Ramirez - Tortosa CL, et al. Curcuma longa extract supplementation reduces oxidative stress and attenuates aortic fatty acid streak development in rabbits. Arterioscler Thromb Vasc Biol. Jul 2002 Jul 1; 22 (7): 1225 - 31. Suryanarayana P, Krishnaswamy K, Reddy GB. Effects of curcumin on galactose induced cataractogenesis in rats. Mol Vis 2003 Jun 9; 9: 223 - 30. Galvano F, Piva A, Ritieni A, Galvano G. Dietary strategies to counteract the effects of mycotoxins: a review. J Food Prot. Jan 2001; 64 (1) 120 - 31. Hwang JK, Shim JS, Pyun YR. Antibacterial activity of xanthorrhizl from curcuma xanthorriza against oral pathogens. Kim SH, Hong KO, Chung WY, Hwang JK, Park KK. Abrogation of cispaltin induced hepatotoxicity in mice by xanthorrhizol is related to its effect on the regulation of gene transcription. Koide T, Nose M, Ogihara Y, Yabu Y, Ohta N. Leishmanincidal effects of curcumin in vitro. Biol Pharm Bull. 2002 Jan; 25 (1): 131 - 3. Nakatani N. Phenolic antioxidants from herbs and spices. Phan TT, See P, Lee ST, Cjan SY. Protective effects of curcumin against oxidative damage on skin cells in vitro: its implication for wound healing. J Trauma. 2001 Nov; 51 (5): 927 - 31. Natarajan C, Bright JJ. Curcumin inhibits experimental allergic encephalomyelitis by blocking signaling through janus kinase - STAT pathway in T lymphocytes IL - 12. J Immunol. 2002; 168 (12): 6506 - 13. Arun N, Nalini N, Efficacy of turmeric on blood sugar and polyol pathway in diabetic albino rats. Plant Foods Hum Nutr. 2002; 57 (1): 41 - 52. Vimala S, Norhanom AW, Yadav M. Anti tumor promoter activity in Malaysian ginger rhizobia used in traditional medicine. White EL, Ross LJ, Schmid SM, Kelloff GJ, Stelle VE, Hill DL. Screening of potencial cancer preventing chemicals for induction of glutathionine in rat liver cells. Oncol Rep. 1998 Mar - Apr; 5 (2): 507 - 12. Ghoneim Al, Abdel - Naim AB, Khalifa AE, El - Denshary ES. Protective effects of curcumin against ischaemis reperfusion insult in rat forebrain. Pharmacol Res. Sep 2002; 46 (3): 273 - 9. Hentschel C, Eglau MC, Hahn EG. Curcuma xanthorriza in clinical use. Inano H, Makota O, Prevention of radiation induced mammary tumors. Int J Radiat Oncol Biol Phys. 2002 Jan 1; 52 (1): 212 - 23. Inano H, Onoda M. Radioprotective action of curcumin extracted from Curcuma longa LINN: inhibitory effect on information of urinary 8 - hydroxy - 2 - deoxyguanosine, tumuro genesis, but not mortality, induced by gammaray irradiation. Int J Radiat Oncol Biol Phys. 2002 Jul 1; 53 (3): 735 - 9. Khafif A, chantz Sp, Chou TC, Edelstein D, Sacks PG. Quantitation of chemopreventive synergism between - epigallocatechin 3 gallate and curcumin in normal, premalignant and malignant human oral epithelial cells. Kim DS, Park SY, Kim JK. Curcuminoids from Curcuma longa L. (Zingiberaceae) that protect PC12 rat pheochromocytoma and normal human umbilical vein endothelial cells from beta (1 - 42) insult. Apr 2001; 303 (1): 57 - 61. Lal B, Kapoor AK, Asthana OP. et al. Efficacy of curcumin in the management of chronic anterior uveitis. Phytotherapy Res 1999; 13: 318 - 22. Lechtenberg M, Quandt B, Nahrstedt A. Quantitative determination of curcuminoids in Curcuma rhizomes and rapid differentiation of Curcuma domestica Val. and Curcuma xanthorriza Roxb. by capillary electrophoresis. Lee SK, Hong CH, Huh SK, Kim SS, Oh OJ, Min HY, Park KK, Chung WY, Hwang JK. Suppressive effect of natural sesquiterpenoids on inducible cyclo oxygenase (COX - 2) and nitric oxide synthase (iNOS) activity in mouse macrophage cells. Lin SC, Lin CC, Lin YH, Supriyatna S, Teng CW. 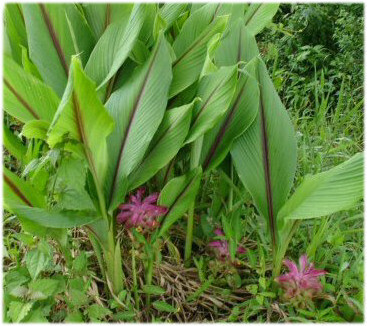 Protective and therapeutic effects of curcuma xanthorriza on hepatottoxin induced liver damage. Lim GP,Chu T, Yang F, Beech W, Frautschy SA, Cole GM. The curry spice curcumin reduces oxidative damage and amyloid pathology in an Alzheimer transgenic mouse. J Neurosci. 2001 Nov 1; 21 (21): 8370 - 7. Naveen Patnaik. The garden of life. Double day, New York, 1993, p. 137. Sachs M, von Eichel J, Asskali F. Wound management with coconut oil in Indonesian folk medicine. Saleheen D, Ali SA, Ashfaq K, Siddiqui AA, Agha A, Yasinzai MM. Latent activity of curcumin against leishmaniasis in vitro. Biol Pharm Bull. 2002 Mar; 25 (3): 386 - 9. Shishu,Singla AK, Kaur IP. Inhibitory effect of curcumin and its natural analogues on geneto toxicity of heterocyclic amines from cooked food. Indian J Exp Biol. Dec 2002 Dec; 40 (12): 1365 - 72. Shoba G, Joy D, Joseph T, Majeed M, Rajendran R, Srinivas PS. Influence of piperine on the pharmacokinetics of curcumin in animals and human volunteers. Planta Med. 1998 May; 64 (4): 353 - 6. Sreejayan, Rao mn. Curcuminoids as potent inhibitors of lipid peroxidation. J Indian Physiol Pharmacol. Dec 1994; 46 (12): 1013 - 6. Srinivasan K, Sambaiah k. The effect of spices on cholesterol 7 alpha hydroxylase activity and on serum and hepatic cholesterol levels in the rat. Soni KB, Kuttan R. Effects of curcumin administration on serum peroxides and cholesterol levels in human volunteers. Indian J Physiol Pharmacol. Oct 1992; 36 (4): 273 - 5. Anonymous. 1997. Antiproliferative effects of curcumin and epigallocatechhin - 3- gallate (EGCG) on normal and premalignant human oral epithelial cells (meeting abstract). Proc Annu Meet Am Assoc Cancer Res 38: A1755. Antony S, et al. 1999. Immunomodulatory activity of curcumin. Immunol Invest 28: 291 - 303. Anto RJ, et al. 2000. L - 929 cells harboning ectopically expressed Rela resist curcumin induced apoptosis. J Biol Chem 275 (21): 15601 - 4. Chuang Se, et al. 2000. Curcumin containing diet inhibits diethylnitrosamine induced murine hepatocarcinogenensis. Carcinogenesis 21: 331 - 35. Churchill M, et al. 2000. Inhibition of intestinal tumors by curcumin is associated with changes in the intestinal immune cell profile. J Surg Res 89: 169 - 75. Ciolino HP, et al. 1998. Effect of curcumin on the aryl hydrocarbon receptor and cytochrome p450 1A1 in MCF - 7 human breast carcinoma cells. Biochem Pharmacol 56: 197 - 06. Elattar TM, et al. 2000. The inhibitory effect of curcumin, genistein, quercetin and cisplatin on the growth of oral cancer cells in vitro. Anticancer Res 20 (3A): 17733 - 38. Incorvia Mattina MJ, et al. 2000. Chlordane uptake and its translocation in food crops. J Agnic Food Chem 48: 1909 - 15. Jobin C, et al. 1999. Curcumin blocks cytokine mediated NK - kappa B activation and proinflammatory gene expression by inhibiting inhibitory factor I - kappa B kinase activity. J Immunol 163: 3474 - 83. Kawamori T, et al. 1999. Chemopreventive effect of curcumin, a naturally occurring anti - inflammatory agent, during the promotion / progession stages of colon cancer. Cancer Res 59: 597 - 601. Korutta L, et al. 1995. Inhibition of ligand induced activation of epidermal growth factor receptor tyrosine phosphorylation by curcumin. Carcinogenesis 16: 1741 - 5. Lertratanangkoon K, et al. 1999. Inhibition of glutathione synthesis with proppargyglycine enhances N - acetylmethionine protection and methylation in bromobenzene treated Syrian hamsters. J Nutr 129: 649 - 56. Lertratanangkoon K, et al. 1997. Increase of unmethylated CpG sites in genomic DNA by glutathione depleting agent (meeting abstract). Proc Annu Meet Am Assoc Cancer Res 38: A1205. Lin LI, et al. 1998. Curcumin inhibits SK Hep 1 hepatocellular carcinoma cell invasion in vitro and suppresses matrix metalloproteinase 9 secretion. Oncology 55: 349 - 53. Liu JY, et al. 1993. Inhibitory effects of curcumin on protein kinase C activity induced by 12 - 0 - tetradecanoyl - 13 - acetate in NIH 3Td cells. Carcinogenesis 14: 857 - 61. Mexico moves to phase out DDT and chlordane. 1997. Env Health Persp 105 (8). Mohan R, et al. 2000. Curcuminoids inhibit the angiogenic responce stimulated by fibroblast growth factor 2, including expression of matrix metalloproteinase gelatinase B. J biol Chem 275 (14): 10405 - 15. Munzenmaier A, et al. 1997. A secreted / shed product of Helicobacter pylori activates transcription factor nuclear factor - kappa B J Immunol 159: 6140 - 47. Ozaki Y. Anti inflammatory effect of of curcuma xanthorriza rocb and its active principles. Park EJ, et al. Protective effect of curcumin in rat liver injury induced by carbon tetrachloride. J Pharm Pharmacol 52: 437 - 40. Pendurthi UR, et al. Inhibition of tissue factor gene activation in cultured endothelial cells by curcumin. Suppression of activation of transcription factors Egr - 1, AP - 1 and NF - kappa B. Arterioscler Thromb Vasc Biol 17: 3406 - 13. Pitasawat B, Choochote W, Tuetun B, Tippawangkosol P, Kanjanapothi D, Jitpakdi A, Riyoung D. Repellency of aromatic turmeric curcuma aromatica under laboratory and field conditions. Innes JF, Fuller CJ, Grover ER, Kelly AL, Burn JF. Randomised, double blind, placebo controlled parallel group study of P54FP for the treatment of dogs with osteoarthitis. Sharma A, et al. 2000. Spice extracts as dose modifying factors in radition inactivation of bacteria. J Agnic Food Chem 48: 1340 - 44. Simon A, et al. 1998. Inhibitory effect of curcuminoids on MCF - 7 cell proliferation and structure activity relationships. Cancer lett 129: 111 - 16. Venkatesan N. 2000. Pulmonary protective effects of curcumin against paraquat toxicity. Life Sci 66 (2): PL21 - 28. Verma SP, et al. 1997. Curcumin and genistein, plant natural products, show synergistic inhibitory effects on the growth of human breast cancer MCF - 7 cells induced by estrogenic pesticides. Biochem Biphy Comm 233: 692 - 96. Verma SP, et al. 1998. The inhibition of the estrogenic effects of pesticides and environmental chemicals by curcumin and isoflavonoids. Environ Health Perpect 106: 807 - 12. Yasni S, Imaizumi K, Sin K, Nonaka G, Sidik. Indentification of an active principle in essential oils and hexane soluble fractions of curcuma xanthorriza Roxb. showing triglyceride lowering actions in rats. Yasni S, Yoshiie K, Oda H, Sugano M, Imaizumi K. Dietary curcuma xanthorriza roxb. increases mitogenic responses of splenic lymphocytes in rats and alters populations of the lymphocytes in mice.